After our first two stops in the capitals of Bangladesh and Sri Lanka, our next partner organisation has taken us to the quiet, calm and picturesque mountains of northern India. In-between the big houses built during colonial time, poverty is difficult to spot. Just looking at the houses built into the stunning mountains, one could be somewhere in Europe looking at the Alps. Big houses, tidy roads and the cool climate make it difficult to believe that we are in India. Only when it comes to food, the variety of spices in the little Dhabas give away that this is still India. The big houses all around Shimla are owned by wealthy families. Shimla is an attractive destination for tourists and pensioners who prefer the cool weather and quietness in the mountains. The demand for construction workers and house maids attracts poor people from all over the northern Indian states. In hope of a better life these families settle wherever there is space in-between the big houses. Surrounded by a number of good private schools, the children of the migrant workers only receive poor education in government schools. Most children from poor family backgrounds start working from a young age onwards. Typically, girls help at home, while boys distribute newspapers or make and sell paper bags. With no space to study at home and with the lack of awareness about the importance of education among the parents, school work is often neglected. This is why Vikram founded the Human Hope Foundation. 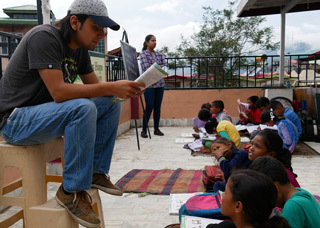 On the terrace of his family home, he invites children to come after school to learn. 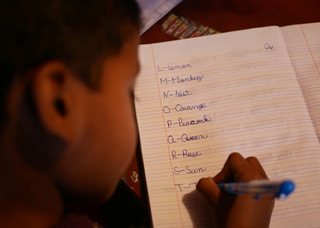 With the help of several volunteers the children can be taught in small groups and learn what school teachers fail to teach. But offering space for children to study is not enough for the children to escape poverty. All Children require an environment where they can play and be a child. Many children do not find this environment at home and play on the streets instead, where it is easy to fall into crime and drugs. For the children to have a future with a well-payed job, they need education. There is a number of skills children have to learn to succeed in life. Next to skills like writing and reading in both the local language and English, the Human Hope Foundation focusses on the soft skills that the children require. Politeness, punctuality and working accurately are skills that are often neglected at their schools. Although only the children come to the Human Hope Foundation in the afternoon, Vikram ensures that he has a good relationship with the parents. Next to visiting their houses on a regular basis, he also provides the parents, especially mothers, with opportunities to generate additional family income. Next to giving the families advice, he offers workshops where the women can learn skills like bag and candle making. The less a family relies on the income of their children, the more opportunity for them to learn. 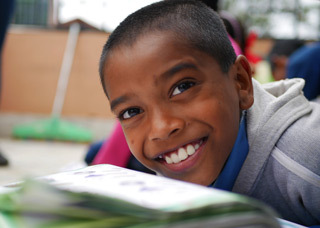 What can we do to help Vikram in his goal of supporting the poorest families and children with their education? Follow our social media channels to find out more about our work.